With New Year resolutions still kicking about around our brains, there is no better time to take up dancing in 2019 and give yourself the gift of dance. Whether you have decided to improve your fitness – and in turn are planning to treat yourself to some brand new clobber – or you would like to learn a particular dance style or technique, there are now more ways than ever to immerse yourself in the world of dance. The start of the new year is a great way of ensuring that extra motivation in achieving those New Year goals. Learning to dance for the first time can be understandably overwhelming, especially for adult dancers. However, there is a multitude of dance classes and opportunities on offer, from those for absolute beginners to improvers to those bordering on the professional. Regardless of the dance level, the benefits of dance are unbounded. 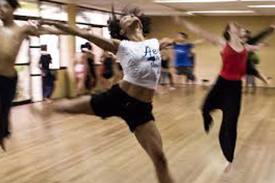 Without a doubt, the physical benefits of dance are top of the list, providing you with increased fitness levels. It’s cardiovascular and toning properties make it a great way to achieve your fitness goals too. Alternatively you might be returning to dance after a break – as an adult dancer you will relish in the increased energy and positivity levels going back to the studio will give you, in addition to adding to your dancing skill set. Whether you take part in ballet, tap or ballroom, dance is a sociable activity which enables students to meet new people and socialise with those who are likeminded. For younger dancers, there is always a good time to begin dancing, or even just taking on a new dance class with a new teacher. This will help encourage aspiration, and help set dance goals for the year. They are always a good way to track progress throughout the year and see how far you have come by December.